Ditch the frozen boxed versions! These homemade, crunchy fish sticks are tastier and freshly made at home, plus they're gluten free! Serve with ketchup or this yogurt-based honey mustard sauce. Nutrition Facts Per Serving (5 fish strips + 2 tablespoons dipping sauce). Pat fish dry. Cut into approximately 30 (2-inch x 3/4- inch) strips. To coat the fish, arrange an assembly line with three large bowls. In first bowl, add cornstarch. In second bowl, add egg and milk; whisk together. In third bowl, add crushed potato chips. Add half of the fish strips in first bowl with cornstarch; toss to coat. Lastly, add to potato chip mixture and toss to coat. Place coated fish on a plate. Repeat coating process with remaining fish. Line a baking sheet with aluminum foil and coat with cooking spray. Arrange fish strips on foil and bake for 12 -14 minutes or until fish is cooked through, turning fish strips over halfway through cooking process. Remove from oven. To make dipping sauce, whisk yogurt, mustard and honey together in a small bowl. 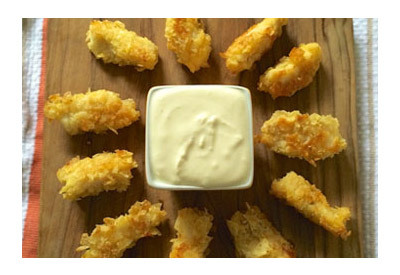 Serve immediately with fish sticks.